The Aethlon Medical mission is to create innovative medical devices and diagnostics that address unmet medical needs in cancer, infectious disease, and other life-threatening conditions. Our Aethlon ADAPT™ System provides the basis for a new class of therapeutics that target the selective removal of disease-enabling particles from the entire circulatory system. The Aethlon ADAPT™ product pipeline includes the Aethlon Hemopurifier® to address infectious disease and cancer and a medical device being developed under a contract with the Defense Advanced Research Projects Agency (DARPA) that would reduce the incidence of sepsis in combat-injured soldiers and civilians. Early stage cancer screening tests based on the high-sensitivity capture of tumor-secreted exosomes in blood or urine. Companion diagnostics based on the analysis of microRNA, proteins and/or other molecules contained in tumor-secreted exosomes captured from a blood or urine sample. Apogenix develops innovative immuno-oncology therapeutics for the treatment of cancer and other malignant diseases. The company has built a promising pipeline of drug candidates that target different TNFSF-dependent signaling pathways, thereby restoring the anti-tumor immune response. BerGenBio is a clinical stage biopharmaceutical company focused on developing first-in-class EMT inhibitors. The Company is a world leader in understanding the biology of epithelial-mesenchymal transition (EMT), which is widely recognised as a key pathway in immune evasion, acquired cancer drug-resistance and metastasis. Building on this original biological insight BerGenBio is developing a promising pipeline of first-in-class AXL and other EMT inhibitors. Biosceptres’ IP portfolio and expertise around the unique biology of the nfP2X7 target also promises significant potential for application & licensing across advanced therapeutic technologies, diagnostic and veterinarian uses. Biothera Pharmaceuticals Inc. is advancing Imprime PGG, a first-in-class, clinical-stage oncology immunotherapeutic that acts as an “ignition switch” to drive a robust, coordinated anti-cancer immune response. While cancers can actively avoid detection by the immune system, Imprime PGG can overcome this by re-awakening the body’s innate defenses. Biothera has established extensive proof of concept and safety results for its lead asset in combination with anti-cancer antibodies and is pursuing additional clinical and translational research in 2016 prior to planned initiation of registration Phase 2/3 studies of Imprime PGG in 2017 – 18. Biothera has partnered with Merck, Eli Lilly and Company, and Cancer Research UK and has entered research collaborations with The Johns Hopkins University, Harvard University, Dartmouth, and the Wistar Institute. In addition, Biothera has assembled an intellectual property portfolio for Imprime PGG consisting of more than 100 US & international patents and patents pending. Charité is one of the largest university hospitals in Europe. All of our clinical care, research and teaching is delivered by physicians and researchers of the highest international standard. Charité proudly lays claim to more than half of all German Nobel Prize winners in Physiology or Medicine, including Emil von Behring, Robert Koch, and Paul Ehrlich. Charité is internationally renowned for its excellence in teaching and training. Charité – Universitätsmedizin Berlin represents a single medical faculty, which serves both Humboldt Universtität zu Berlin and Freie Universität Berlin. Charité extends over four campuses, and has close to 100 different Departments and Institutes, which make up a total of 17 different CharitéCenters. Having marked its 300-year anniversary in 2010, Charité is now one of the largest employers in Berlin, employing 13,200 staff (or 16,850 if including its subsidiaries), and with a total annual turnover of €1.6 billion. Curis is a biotechnology company focused on the development and commercialization of innovative and effective drug candidates for the treatment of cancers, including its lead development candidate, CUDC-907, that is being investigated in clinical studies in patients with lymphomas and solid tumors. Curis is also engaged in a broad collaboration with Aurigene in the areas of immuno-oncology and precision oncology. As part of this collaboration, Curis has exclusive licenses to oral small molecule antagonists of the PD-1 pathway/VISTA, including PD-L1/VISTA antagonist CA-170, as well as to oral small molecules designed to inhibit the IRAK4 kinase, including CA-4948. Curis is also party to a collaboration with Genentech, a member of the Roche Group, under which Genentech and Roche are commercializing Erivedge® for the treatment of advanced basal cell carcinoma, and are further developing Erivedge in other diseases including idiopathic pulmonary fibrosis and myelofibrosis. Etubics Corporation is a clinical stage biotechnology company focused on developing immunotherapeutics for the treatment of cancer and vaccines against infectious diseases. The Company has a pipeline of product candidates based on our proprietary, advanced generation viral vector platform, the Etubics Platform, to generate both T cell mediated and antibody responses and its complimentary manufacturing human-based cell line. The Company’s lead product, ETBX-011, has completed Phase 1/2 clinical trials in metastatic colorectal cancer patients. ETBX-011 targets carcinoembryonic antigen (CEA) which is expressed in many types of cancer and we believe the product has broad clinical application. Etubics Corporation has a Cooperative Research and Development Agreement (CRADA) with the National Cancer Institute, a part of the National Institutes of Health, to investigate a multi-targeted immunotherapy approach containing three tumor-associated antigens including ETBX-011. These three antigens are highly expressed in various human carcinomas and has the ability to simultaneously target all three which could be of significant clinical benefit in terms of overall survival of cancer patients. Additionally, the Company is manufacturing an immunotherapeutic that is directed against HER2/neu (ETBX-021). This product candidate may soon be employed in Phase 1 clinical trials for the treatment of patients with HER2+ breast cancer. Furthermore, the Company has a collaboration agreement with Duke University, Durham, NC for the development of a HER3 based breast cancer immunotherapeutic (ETBX-031) which is moving forward to clinical trials. Etubics Corporation also collaborates with Sanford Cancer Center, Sioux Falls, SD on the development of a product candidate that targets human papilloma virus (HPV) for the treatment of HPV induced cancers such as head and neck and cervical (ETBX-041). In addition, the Company is developing vaccines to combat infectious diseases and emerging pathogens, including a universal influenza vaccine (ETBX-051). Etubics Corporation was founded in 2003 and is headquartered in Seattle, Washington. ex scientia is progressing a unique range of small molecule assets in the field of immuno-oncology. Our unparalleled design capability allows us to move beyond the restrictions of single target compounds to also design bispecific small molecules (a compound that can interact productively - at separate times - with two complementary targets. By applying our design approach we deliver compounds with clear market differentiation. Our lead portfolio is an adenosinergic focused strategy covering both single and bispecific opportunities. F-star designs and develops bispecific antibody products to improve the treatment of cancer. F-star is the only biopharmaceutical company creating bispecific antibodies by modifying the constant region of an antibody. Our Modular Antibody Technology offers unprecedented ease in the development and manufacturing of genuine bispecific antibody products. F-star's Modular Antibody Technology allows easy combination of antibody specificities in a "plug-and-play" manner to create unique mAb2 bispecific antibodies and exlpore their novel biology. An Fcab against a single target can be combined with the variable regions of as many different existing antibodies as desired. A mAb2 is full-length antibody which looks like mAb, works like mAb, behaves like mAb and performs beyond mAb. F-star is developing several products in the immuno-oncology space and has partnerships with AbbVie, BMS, Merck Serono and Boehringer Ingelheim. Galena Biopharma, Inc. is a biopharmaceutical company committed to the development and commercialization of targeted oncology therapeutics that address major unmet medical needs. Galena’s development portfolio is focused primarily on addressing the rapidly growing patient populations of cancer survivors by harnessing the power of the immune system to prevent cancer recurrence. The Company’s pipeline consists of multiple mid- to late-stage clinical assets, including novel cancer immunotherapy programs led by NeuVax™ (nelipepimut-S) and GALE-301. NeuVax is currently in a pivotal, Phase 3 breast cancer clinical trial with several concurrent Phase 2 trials ongoing both as a single agent and in combination with other therapies. GALE-301 is in a Phase 2a clinical trial in ovarian and endometrial cancers and in a Phase 1b given sequentially with GALE-302. Immune Pharmaceuticals (NASDAQ: IMNP) applies a personalized approach to treating and developing novel, highly targeted antibody therapeutics to improve the lives of patients with inflammatory diseases and cancer. Immune's oncology pipeline includes Ceplene®, Azixa® and Crolibulin® as well as bispecific antibodies and nanotherapeutics, including NanomAbs, a second generation antibody drug conjugate technology, with chemotherapeutics in order to enhance their safety and efficacy profiles by delivering the medicines directly to cancer cells. Immune's lead product candidate, bertilimumab, is in phase II clinical development for moderate-to-severe ulcerative colitis as well as for bullous pemphigoid, an orphan autoimmune dermatological condition. Other indications being considered for development include atopic dermatitis, Crohn's disease, severe asthma and NASH (an inflammatory liver disease). Immune recently expanded its portfolio in immuno-dermatology with topical nano-formulated cyclosporine-A for the treatment of psoriasis and atopic dermatitis. Immune's non-core pipeline includes AmiKet™, a late clinical stage drug candidate for the treatment of neuropathic pain. Immune is headquartered in the U.S. (Alexandria Center for Life Science, NY), with its primary R&D facilities in Israel. Our main product, INTUVAX, an off-the-shelf cellbased product for personalized treatment, has been evaluated in a finalized clinical Phase I/II-study in metastatic renal cell carcinoma with promising follow up data showing a massive intratumoral infiltration of CD8+ T cells in the majority of treated patients and a more than double ongoing median overall survival for the whole group (11 patients) and more than tripple prolonged and ongoing median overall survival for patients with poor prognosis (6 patients). A clinical phase II-trial (90 parients) is currently being performed in Europe and will be expanded into the US in 2016. Prelmininary data on intratumoralinfiltration of CD8+ T cells indicate tumor specific immune response. We are also finalizing a clinical Phase I/II-study in primary liver cancer, so far showing clear indications of tumor specific immune responses that directly correlate with prolonged survival for the majority of fully treated patients (9). Our goal is to provide cancer patients with treatments that improve both survival and quality of life. Our research is based on platform technologies, enabling us to develop immune enhancers against a wide spectrum of cancer types. JW Pharmaceutical Corporation (formerly Choongwae Pharma.) is one of the leading pharmaceutical companies in Korea. JW is currently exploring early stage oncology R&D via a collaborative effort between the JW Drug Discovery Center in Korea and the JW Theriac Corp in Seattle in the US. This early R&D activity is facilitated by internally developed platform technologies that led to the targeted approach being used for oncology indications. Our oncology pipeline of product candidates is led by CWP291, the First-In-Class Wnt Signaling Inhibitor currently in phase I study in US and Korea for Acute Myeloid Leukemia and Multiple Myeloma. Memgen is a clinical-stage biotech company who's lead product, ISF35, is a first-in-class viral cancer immunotherapy encoding an optimized version of CD40 ligand. Memgen's ISF35 viral cancer immunotherapy is being combined with checkpoint inhibitors to potentially treat a broad range of cancer types, including but not limited to metastatic melanoma, bladder cancer, renal cell cancer and hepatocellular carcinoma. 1. Pre-clinical data by MD Anderson showing that ISF35 in combination with checkpoint inhibitors cures 40% of mice in a B16 model of metastatic melanoma and eradicates melanoma in the brain. 2. Phase 1/2 study protocol by MD Anderson of ISF35 plus KEYTRUDA in checkpoint inhibitor refractory metastatic melanoma. 3. Phase 2 study protocols at MD Anderson of ISF35 with OPDIVO for metastatic renal cell carcinoma. 4. Orphan drug designation of ISF35 for advanced melanoma. ​Merrimack is a fully integrated biopharmaceutical company that views cancer as a complex engineering challenge. Through systems biology, which brings together the fields of biology, computing and engineering, Merrimack aims to decrease uncertainty in drug development and clinical validation, and move discovery efforts beyond trial and error. Such an approach has the potential to make individualized treatment of patients a reality. ​Merrimack's first commercial product, ONIVYDE® (irinotecan liposome injection), was approved by the U.S. FDA in October 2015. With four additional candidates in clinical studies, several in preclinical development and multiple biomarkers designed to support patient selection, Merrimack is building one of the most robust oncology pipelines in the industry. For more information, please visit Merrimack's website at www.merrimack.com or connect on Twitter at @MerrimackPharma. Mirna Therapeutics, Inc., a clinical-stage biopharmaceutical company, develops microRNA-based oncology therapeutics. Its lead product candidate is MRX34, a mimic of naturally occurring microRNA-34 encapsulated in a liposomal nanoparticle formulation that is in Phase 1 clinical trial. The company was founded in 2007 and is headquartered in Austin, Texas. Mirna Therapeutics, Inc. operates as a subsidiary of Asuragen, Inc.
Nanobiotix is a leader in nanomedicine. We have developed a revolutionary concept dedicated to the local treatment of cancer with radiotherapy based on a purely physical mode of action. This approach is compatible with any small molecule, biologic or immune-therapy. The company focuses on the development of its most advanced product NBTXR3. It is expected to publish interim data of a registration study during summer 2016 and to commence the commercialization in 2017. At the Immuno-Oncology: BD&L and Investment Forum Nanobiotix will present the concept behind its immune-therapy program with NBTXR3. 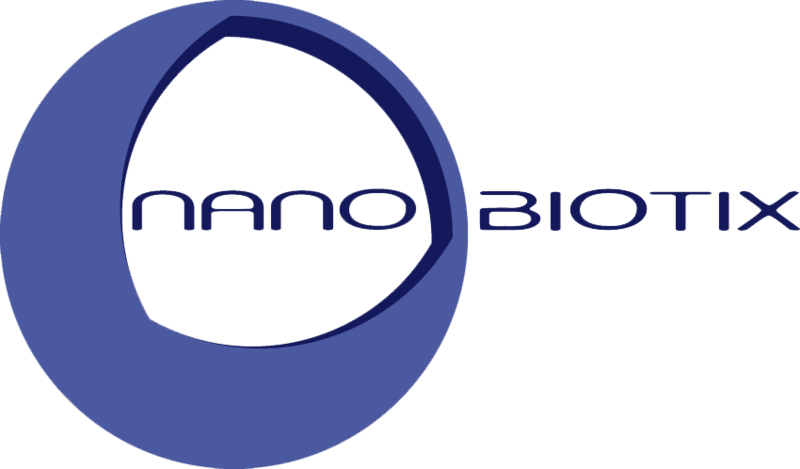 Nanobiotix is listed on the regulated market of Euronext in Paris (ISIN: FR0011341205, Euronext ticker: NANO, Bloomberg: NANO: FP). The Company Headquarter is based in Paris, France. An affiliate is located in Cambridge near Boston, United States. Oncology Venture AB was formed in 2012 by Danish and US oncology specialists and business people dedicated to unlock the potential of oncology products that has shown efficacy but not enough to beat the gold standard – to improve the efficacy of the drugs, increase the response rate in cancer patients, reduce timelines and through this improve success rates in Oncology Drug Development. OncoSec is a biotechnology company developing DNA-based intratumoral immunotherapies with an investigational technology, ImmunoPulse™, for the treatment of cancer. ImmunoPulse™ is designed to enhance the local delivery and uptake of DNA-based immune-targeting agents, such as IL-12. In Phase I and II clinical trials, ImmunoPulse™ IL-12 has demonstrated a favorable safety profile and evidence of anti-tumor activity in the treatment of various skin cancers as well as the potential to initiate a systemic immune response. OncoSec's lead program, ImmunoPulse™ IL-12, is currently in clinical development for several indications, including metastatic melanoma, squamous cell carcinoma of the head and neck, and triple-negative breast cancer. In addition to ImmunoPulse™ IL-12, the Company is also identifying and developing new immune-targeting agents for use with the ImmunoPulse™ platform. OSE Immunotherapeutics results from the merger between Effimune and OSE Pharma (May 31, 2016). The combined company is a new international player in immunotherapy. It offers innovative immunotherapies based on the activation and the regulation of the immune system, with clinical applications in immuno-oncology, auto-immunity and transplantation. Tedopi®, a specific T immunotherapy that activates cytotoxic T lymphocytes and targets patients with Non-Small Cell Lung Cancer (NSCLC) and who are HLA-A2 positive. o Tedopi® is currently in Phase 3 registration clinical trial for lung cancer in Europe and in the USA; trial completion is expected in 2018.
o A Phase 2 clinical trial of Tedopi® combined with a checkpoint inhibitor is considered for lung cancer in 2017, in partnership with a European research organization. o New indications for other cancers involving a strong medical need are considered with industrial partners. Tedopi® is open for partnership on Territories and co-development. Effi-DEM, is being developed for immuno-oncology. It is a second generation checkpoint inhibitor. It targets particular suppressor cells present in the tumor microenvironment, associated with a poor prognosis. They are myeloid-derived suppressor cells (MDSC) and macrophage cells associated with tumors called “Tumor Associated Macrophages” or TAM. TAM cells are a major part of the tumor microenvironment in the case of aggressive tumors and are linked to malignant progression. FR-104 is in a Phase 1 clinical trial : a CD-28 antagonist, optimized monoclonal antibody fragment targeting the CD-28 receptor, a key receptor in effector T lymphocytes. Janssen Biotech ( a subsidiary of Johnson & Johnson) has an option on licensing the full rights for this product after the phase 1. Another asset available for partnering is Effi-7 targeting CD127 (alpha chain of the Interleukin-7 receptor) with comprehensive pre-clinical data in various auto-immune disease models and a first clinical focus in ulcerative colitis. The new combined entity OSE Immunotherapeutics will build together a significant immunotherapy player focused on Immune Activation and Regulation. ​UbiVac is a clinical stage biotechnology company engaged in the research and development of therapeutic vaccines to combat cancer and infectious diseases. UbiVac is a company that offers a pipeline of groundbreaking immunotherapies in preclinical and clinical stage trials. Since 2005 the company has been engaged in the research, development and testing of therapeutic immunotherapy strategies to combat cancer and infectious diseases.